The Audio and Music Engineering (AME) Program combines studies in engineering and applied sciences with music and audio production to give students a technically rigorous, design-based education in the field of audio, music and sonic engineering. The curriculum is built on a foundation of basic math and science and integrates elements of music, audio content production, acoustics, fundamental engineering science, signal processing hardware and software, electronics, and software engineering. Through a series of design- and project-based classes integrated with their other coursework, students build a project portfolio throughout their studies, which is then capped by a senior design project. 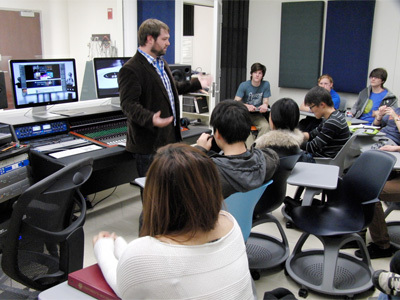 For more detailed information about the Audio and Music Engineering Program here at Rochester, check out the program objectives page and AME Curriculum Guide (PDF). Students requiring assistance should first consult their primary faculty advisor or the AME program undergraduate coordinator. The AME Program Chair must review and approve all transfer courses. If a student wishes to take a course at another institution to satisfy an AME degree requirement, prior approval is required and proper supporting documentation about the course must be submitted to the AME Program Undergraduate Coordinator. A Course Approval Form, available in the Electrical and Computer Engineering Office, is to be used for this purpose. Students are strongly advised to seek the advice of their advisor before registering for a course at another institution. Completed forms will be forwarded to the Undergraduate Program Chair for action.